Pictured from left to right: Mark Lehman '71, Claire Taben '20 and Harriett Lehman '72. Claire Taben '20 likes studying international business & management because it allows her to explore many facets of business while she narrows her focus. Through her classes with Lecturer in International Business & Management Steve Riccio, she took a chance on an advertisement for an internship—and the result gave her much more than professional experience. Feeling confident in what she learned during a human resources (HR) class in the spring, she applied for an internship position at Winplus North America Inc., a company that specializes in automotive lifestyle products. And she didn't the 2,600 miles between Dickinson and Winplus in Costa Mesa, California, deter her. Taben knew she was stepping out of her comfort zone. The Connecticut native had only been to California once before, but she was primed to overcome any hurdles that stood in her way. After all, there was at least one Dickinsonian in her corner—former history major turned CEO of ADCHoldings (Winplus’s parent company) and Dickinson Trustee Mark Lehman ’71. Taben was one of several interns (others came from California State University, Fullerton, and Emory University), but her affiliation with Dickinson stood out to the CEO, and Lehman plans to continue to recruit interns from Dickinson. 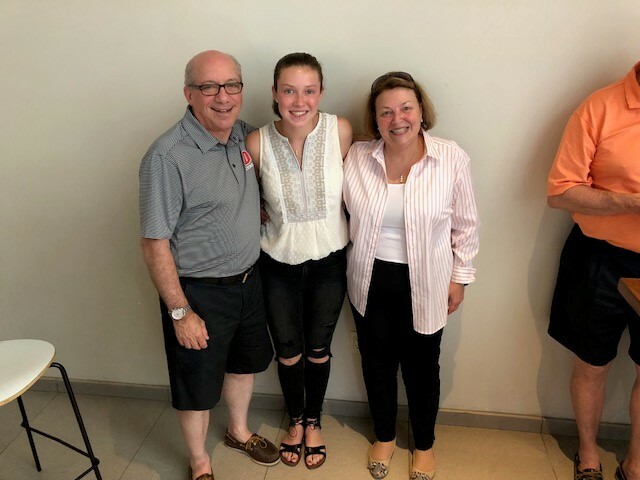 Lehman and his wife, Harriett '72, hosted Taben in their home for the duration of her internship, and from what Taben calls her “semester abroad in California,” an extraordinary friendship blossomed. “It was almost like the lifestyle that they lived—how welcoming they are—reflected back on Winplus,” Taben says, reminiscing fondly about eating dinners with the Lehmans each night and making ice cream runs to Strickland’s. “We just bonded,” Taben adds, noting the similarities between them, despite the decades that separated them. Taben, a field hockey player for the Red Devils, and Lehman, a track and cross country runner, spent much time discussing the college as they both know it today. For Taben, this internship offered much more than general job experience. Although she did use it to weigh her options for the future, it opened her eyes to how a large global company operates. As part of her internship, Taben managed an onboarding orientation program for incoming employees at Winplus. She also assisted the other interns with a marketing proposal, which ignited her interest in business marketing. Looking back, Taben feels optimistic about the future, and rightfully so with an alumnus like Lehman behind her. “They really inspired me to pay it forward to other Dickinsonians in the future, if I’m able, because of what they’ve done for me in just a seven-week period,” she says.